I’m finding the vibrant yellows and reds a bit harder to translate to watercolor paint…..maybe if I used my full (Graham) palette, vs. the Cotman travel palette, I’d have better luck. But since I paint these at night in my lap while watching TV, the travel palette is much more convenient! I hope you have time to enjoy the crisp air and some of the joys of (almost!) fall this Sunday. Peace. These are amazing! Your use of shadow makes me feel I could reach down and pick one up off the paper. Thank you, Beverly! I so appreciate your encouraging praise! Awesome Job! I especially love the top one. Do you paint or draw first? How do you do the slight veins (credit card corner like Lindsey?) Beautiful leaves Laura! Leaves can be tricky with folds, tears, and uneven edges. You have stepped up to the challenge and your leaf paintings are wonderful. Your 30 day leaf painting will teach us all a few tips and tricks. Have a beautiful Sunday Laura. Awww what a kind thing to say; thank you, my friend. Have a wonderful Sunday! Oh and thank you, Charlie!! I think the colors, the shapes, the shadows…everything!…about your paintings are perfect! A painting doesn’t have to mirror real life; it should actually make it more thoughtful and pretty and you’ve done that! Thank you, Teresa! I appreciate that!!! These are wonderful! I love how you captured all the broken bits, and holes. I brought home two Oak leaves a couple of weeks back and have painted one. You’ve inspired me to go on a hunt for more leaves! I think the Liquid Amber leaves are turning from green to orange/yellow here. I hope to get out and find something. Thanks, Kari! I’m glad you enjoyed this! What a great exercise. I have to try this when back at home. Color matching is tough, but you are doing great. Thanks, Kirk! When I painted this I wasn’t really happy but then the painting fairies came overnight and I liked it much better the next day lol. You should try it and I think you’d be really good at it. I think you’re good at soft lines!! well done. nice delicate shadows too! Loving your leaves Laura! Like the red colors! Yes, the leaves do curl up quickly – sometimes I press them in an old book if I don’t have time to paint them right away. 😊🍁🍂🌿 Happy Sunday! Same to you, Jill! I’m glad you are enjoying my leaves. There’s nothing like the colors of fall. 🙂 I was curious if you got a chance to see my little quilt yesterday? I’m wondering if painting on fabric is going to have the impact I’m looking for…..still interested in doing art quilts though. I’ve been pre-washing my fabric alllll weekend. I had no idea how much fabric I had. I bet we could all say that! Hope you had a good weekend. Wonderful work on those leafs. I tried this last year, I know it’s quite hard to capture the colors, the shapes, the tears and the shadow. You did really wonderful! Thanks, Corinne! I practiced flowers all summer, and I think that really is helping me with the leaves. I hope you try a few this season too! Lovely – this reminds me of an activity I had my college students do. They used a variety of art materials to represent and document their experiences with natural objects. The watercolor images were as striking as the discoveries they made about the leaves. Thanks! Sounds like a wonderful activity. 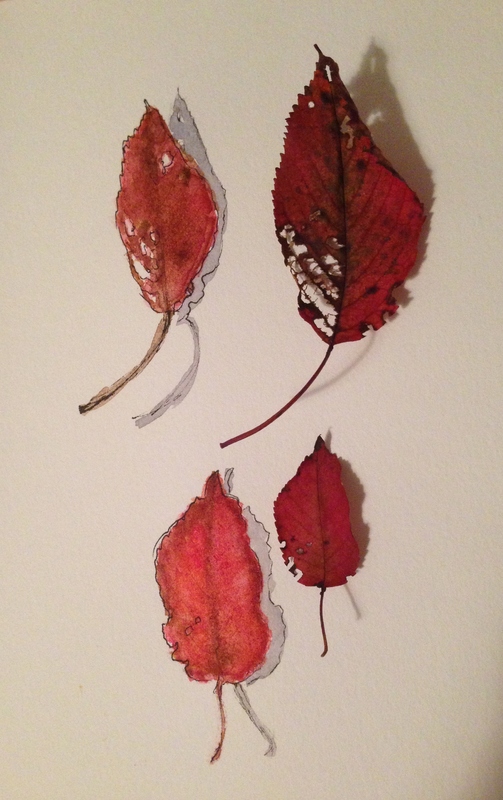 Watercolor, to me, is the perfect way to represent leaves. I love dropping paint into the damp paper and watching what happens. I’m glad you liked this one! Outstanding work Laura, your paintings are beautiful. It is hard to tell sometimes where the actual leaf ends and the painting begins. My favorite so far – – great delicate handling of the holes and shadows. A wonderful exercise on developing the eye in drawing and painting. Beautiful selection of red shades as well Laura! Thanks, Mary! I’m having a good time with it. A challenge, but doable. Thank you so much, Ann! Hey did you see my art quilt? I posted it Saturday. Was curious what you’d think. This has to be my favorite in your leaf study, something about the crumbled leaves bearing holes is wonderful. Relates to life, sometimes we loose parts of ourselves over time but we are still whole and beautiful. Wow. Awesome. Thank you, Jennifer. How profound and beautiful (and so true) is that statement! Have a great night! Love these, the shadows are great. I think they are my favourite so far….. Thank you, Tori! I’m really enjoying painting a leaf (almost) daily. Oh. I LOVE these ones! How do you work when you paint your leaves? Do you work in layers… starting with lighter and working to darker? Thank you! I try very hard to just do the whole thing in one layer whenever I paint, but I find that typically with these strong colors, I have to add a second layer after it dries just to deepen the hues a bit. I’m so glad you like my leaves!! I consider that a huge compliment, esp. from someone like you who is so extraordinarily good at capturing them! Aww, you’re so kind to say that! I’m so amazed at what you do with just one layer! Wow. Layers are my way of working. I find it easer to create more depth by continually adding colors (light to darker). BB, I find that M. Graham paint often does not need the layers. Although most of my leaves here I’ve done with the Cotman travel palette. Maybe the pan paints are a little stronger? My Graham palette is tube paint but the colors are extremely juicy and vibrant and much less expensive than WN – but still artist quality, and IMO much better quality than WN. They hardly need to be refreshed when I open my palette. They are juicy and wonderful! And made in Washington state, I believe! Oh that is so cool! I don’t believe I have ever used the Graham palette… wonder if it is even sold around here. I will have to start keeping my eyes open. I am excited about a new tool that a friend sent to me that is a brush you can put water into. So then drawing with watercolor pencils, you have the wonderful water/brush tool along and you can be watercoloring on the go. It is so cool! When I do some more playing with it, I’ll post a picture of this brush. It wasn’t what I was expecting. I’d love to see it! Is it called a waterbrush? If so, I may have one but I don’t use it much. Sounds like you’re enjoying it! It may be called a waterbrush… that makes sense. It is a fun little art toy!